The Chrome browser is the most popular because compared to Explorer, Edge, Safari and Firefox it wins on stability and performance. While I use different browsers, I never have to quit Chrome no matter how many tabs I have open. Unlike the rest, it never hangs or locks up. If you are a blogger or writer, you probably know this already. Chrome is a workhorse. The other advantage that Chrome has is the vast number of extensions or web apps that are available in the Chrome Web Store. 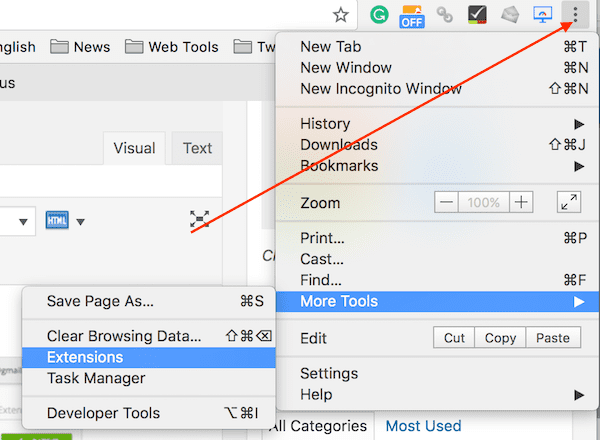 For almost any task you can think of, there is an extension you can add to your Chrome menu. The beauty of these small programs is that they sit next to your browser’s address bar and you can activate them with just one click. If you are a writer or a blogger, and you are probably both, there are a handful of excellent Google Chrome web apps that I highly recommend. All of them are big timesavers or add extra functionality on particular web pages, such as when you are writing and publishing from your blog editor. To search for new apps, go to the Web Store. Now type a brief description in the Search Box and click on a suggestion that appears in the drop-down list. You will see the range of apps that are available. Select, Add To Chrome, and your extension will be installed automatically, and it will appear next to your address bar and ready to use on an open tab. To manage your extensions, click on the small more options icon in the top right-hand corner of your browser. It is sometimes called a hamburger menu. You can access all your extension management from here. Then click More Tools, and then Extensions. You will see a card layout of all your extension files. In this screen, you can check the details or turn apps on and off, or remove them. So now you know how to install and manage extensions, let’s get to the list of the best ones. 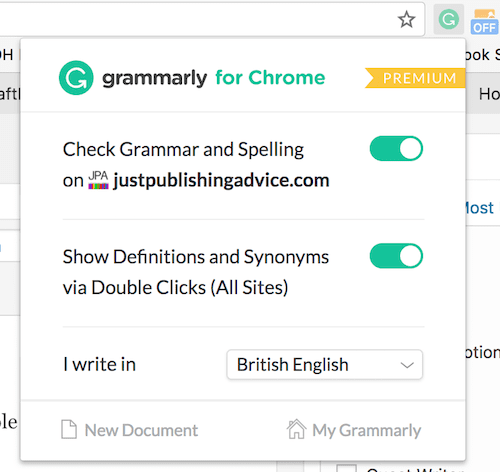 Without a doubt, the free Grammarly extension is the first one to install for any writer. You will need to register with Grammarly first; then you will be able to install the app. Once it is up and running, you can activate or deactivate it in one click, or change your basic preferences. When activated, it will check your spelling and grammar and offer practical advice on any web page you are actively viewing. Needless to say, it is always running on Chrome when I am working. Grammarly works on so many sites. Turn it on and start writing. You can use it when you are on social media, blogging, writing a short story or a term paper. Alternatively, for fiction authors, you might want to consider Prowritingaid which also has a free Chrome extension. It is ideally suited to long-form creative writing. It is used by many fiction writers because of the deeper analysis the program supplies. You don’t need to leave what you are doing to get a quick snapshot of your site traffic. With Google Page Analytics, you can get an instant idea of what is happening. Not only does it give you stats on real-time visitors and page views, but it also has a bonus function that gives you an indication of click percentages. Just that information alone is worth installing the app so you can decide which links are working best for you. 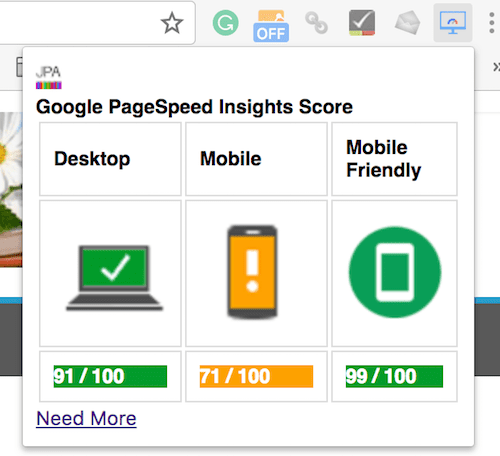 Instead of going to the Google testing page and waiting for it to grind out a result, the Pagespeed Insights app gives you a quick result in seconds. All you need to do is click on the extension’s icon, and you can check an approximate speed rating for the page you are currently viewing. Yes, well apparently I have some work to do on my mobile speed. 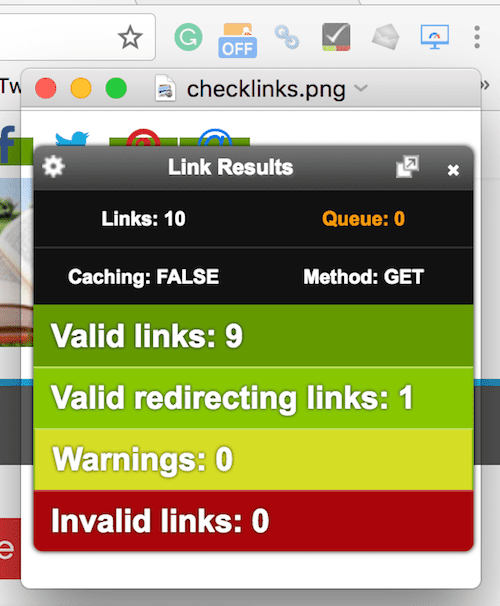 As the name implies, the NoFollow app checks for nofollow links on a web page. You can turn the app on and off from its icon, and then check any page for nofollow links. Any link highlighted by a red dotted box is a nofollow link. This app goes one step further. Check My Links looks at all the links on a page. It looks like I got the all clear for the page I checked. This tool is so quick and convenient for checking for broken links on pages and posts on your blog. 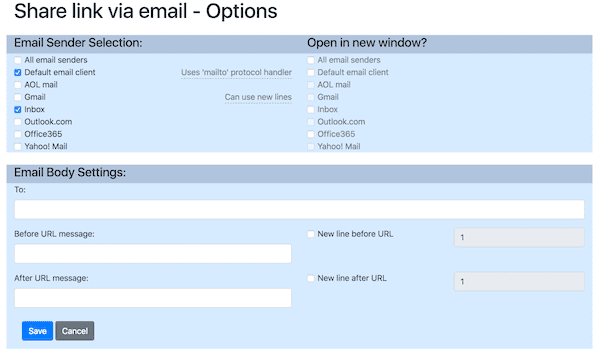 If you use Safari, you know it has a handy button to send a link by email quickly. It is the one function that is missing from the Chrome browser. But you can add it with the Share Link via Email app. For a small app, it comes with lots of settings so you can get it working just how you like. It’s a pain always having to be online when you want to use Google Docs. Well, you don’t have to interrupt your writing process if you are offline. The Google Docs Offline extension lets you edit your documents, spreadsheets and presentations when you aren’t connected to the Internet. 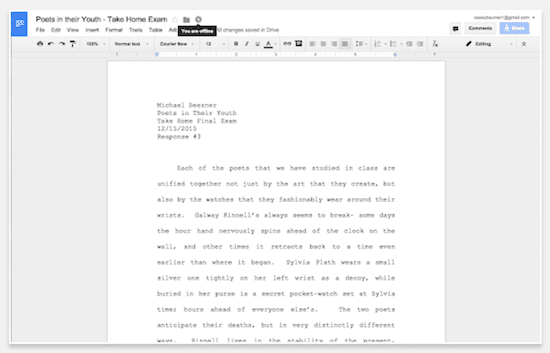 If you are fiction writing using Google Docs, offline access gives you much more freedom. There are 1,000s of Google Chrome extensions available, and almost all are free. However, you need to be selective and don’t overload your browser with too many. Choose ones that are essential for you and will improve the way you work. The seven apps I have listed are easy to understand and the ones I use every day. But I do have a few more for SEO checks that I use from time to time. How many Google extensions do you have?